A mass of water moving down a height difference contains energy which can be harvested using some waterwheel or turbine. The moving water drives the waterwheel and this rotation either drives machinery directly (e.g. mill, pump, hammer, thresher, ...) or is coupled with a generator which produces electric power. Hydro power is probably the first form of automated power production which is not human / animal driven. Moving a grind stone for milling first, developed into the driving of an electrical generator. Next to steam it was for long the main power source for electricity.Its continual availability does not require any power storage (unlike wind / solar power). It is mainly mechanical hardware. This makes it relative easy to understand and repair-/maintainable. In smaller units its environmental impact becomes neglect-able (see: environmental impact assessment and pros and cons of micro hydropower). These specific conditions limit generalising and standartisation of "how to install hydropower plants". Choosing the right location and planning requires some specific knowledge. With knowledge of water flow and height difference the potential power can be estimated. 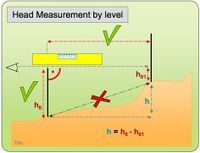 The first step to judge a sites hydropower potential is to measure/estimate head and flow. Head is very often exaggerated as is the flow rate, which varies over the year! Wrong data occurs frequently. Confirmation of existing data is highly recommended! Head and flow are the two most important facts of a hydro site. This will determine everything about the hydro system - volume of civil constructions, pipeline size, turbine type and power output. Inaccurate measurements result in low efficiency, high cost and scarcity of power. For sophisticated methods how to inquire a sites feasibility, please check the Manuals section. "Layman's book: How to develop a Small Hydro Site" may be a good start. Estimation of height can be done easiest if there is a steep slope (waterfall) by rope. By measuring total height step by step, it's crucial to do the bearing strictly horizontally. Ensure that by using a level or a water filled hose. Widely available are hoses and pressure gauges which allow the easiest method of height measurement. 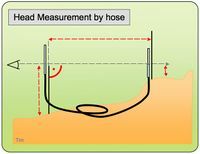 As longer the hose as less steps have to be taken to measure the total head. 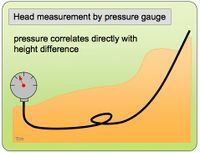 Estimation of flow is very difficult without measurement. First, measure the waters speed at an steady flowing part of the river. Therefore drop some item and stop the time it needs for a certain distance to float. Second, do a sketch of the rivers cross section by measuring its depth every 20-50 cm so you come up with a grid showing the rivers profile from side to side. With this data its cross sections area can be calculated easily. Finally the flow volume results from (water) speed x (section) area. A ball drifts 10 m in 12 s => speed = 10m/12s = 0.12 m/s. Gross heat: height difference the water "falls down"
Hydropower installations can be classified by size of power output, although the power output is only an approximate diversion between different classes. There is no international consensus for setting the size threshold between small and large hydropower. For the United Nations Industrial Development Organization (UNIDO) and the European Small Hydropower Association (ESHA) and the International Association for Small Hydro (IASH) a capacity of up to 10 MW total is becoming the generally accepted norm for small hydropower plants (SHP). In China, it can refer to capacities of up to 25 MW, in India up to 15 MW and in Sweden small means up to 1.5 MW, in Canada 'small' can refer to upper limit capacities of between 20 and 25 MW, and in the United States 'small' can mean 30 MW. The German Federal Ministry for Environment, Nature Conservation and Nuclear Safety mentioned that a SHP is <1 MW, everything above is a large hydro electric plant and usually comes along with a large dam. The International Commission on Large Dams (ICOLD) defines a large dam as a dam with a height of 15 m or more from the foundation. If dams are between 5-15 m high and have a reservoir volume of more than 3 million m3, they are also classified as large dams. Using this definition, there are over 45 000 large dams around the world. < 100 kW partially grid con. There is no binding definition how mini hydro power output is to be classified. Rules for communication avoiding misunderstandings: Generally the terms can be used "downwards compatible". Pico- is also Mini- but not visa versa. Specific terms (Pico, Family) should be used only if they are required to indicate specifics. The spectrum needs higher diversification as smaller it becomes as there are certain differences in technique, usage, applicability and the grade of of ability to replicate them. 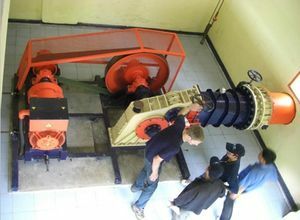 there are "over the counter" pico turbines available for "self installation"
Micro hydro is perhaps the most mature of the modern small-scale energy supply technologies used in developing countries. There are thought to be tens of thousands of plant in the “micro” range operating successfully in China, Nepal, Sri Lanka, Pakistan, Vietnam and Peru. Historically the term hydropower developed from naming very small units towards nowadays huge dams. Then there where new terms created to separate different clusters. All of them are hydropower. What is considered "mini or "micro" may be defined once and forever ... or not. If there are different opinions on this topic you're welcome to open a discussion group on this. Classification according to size has led to concepts such as ‘small hydro’ and ‘large hydro’, based on installed capacity measured in MW as the defining criterion. Defining hydropower by size is somewhat arbitrary, as there are no clear relationships between installed capacity and general properties of hydro power or its impacts. Hydro power comes in manifold project types (see Classification By Facility Type) and is a highly site-specific technology, where each project is a tailor-made outcome for a particular location within a given river basin to meet specific needs for energy and water management services. Large hydropower developments involve large dams and huge water storage reservoirs. They are typically grid connected supplying large grids. Preference for large hydro is on the decline due to the high investment costs, long payback periods and huge environmental impacts (losses of arable land, forced migration, diseases and damage to biodiversity). Many social and environmental impacts are related to the impoundment and existence of a reservoir, and therefore are greater for 'large hydro' plants with reservoir. Small hydropower stations are typically run-of-the-river. They combine the advantages of hydropower with those of decentralised power generation, without the disadvantages of large scale installations. Advantages include: low distribution costs, no/low environmental costs as with large hydro, low maintenance and local implementation and management. Power generated with small hydro station can be used for agro-processing, local lighting, water pumps and small businesses. The constructions and integration into local environments of Small Hydro Power (SHP) schemes typically takes less time and effort compared to large hydropower plants. For this reason, the deployment of SHPs is increasing in many parts of the world, especially in remote areas where other energy sources are not viable or are not economically attractive. General concepts like ‘small’ or ‘large hydro’ are not technically or scientifically rigorous indicators of impacts, economics or characteristics. Hydropower projects cover a continuum in scale, and it may be more useful to evaluate a hydropower project on its sustainability or economic performance, thus setting out more realistic indicators. Small and micro hydropower utilizes water that runs of a river and avoids big environmental impacts. Pumped storage hydro power plants (HPPs) work as energy buffer and do not produce net energy. In-stream Hydropower Schemes use a rivers natural elevation drop without to dam a river. It is suitable for rivers that have at least a minimum flow all year round. RoR plants usually have no or only small storage, allowing for some adaptations to the demand profile. Basically in-stream Hydropower functions like a RoR scheme, but the turbine is mostly built within the dam in the riverbed. Usually the river flow is not diverted. ► Text and Figures of this chapter are originally mainly taken from the Chapter 5 of the IPCC Special Report on Renewable Energy Sources and Climate Change Mitigation (2011). In 2010, in 161 countries hydropower is installed making up a worldwide installed hydro electric capacity of 926 GW which provide one-fifth of the world's electricity supply. Out of these 161 countries five countries make up more than the half of the world's hydropower production: China (~200 GW), Canada (74.4 GW), Brasil (84 GW), the USA (78.2 GW) and Russia (49.7 GW). Often hydropower is the main or even only source for electricity production in developing countries. Any other conventional energy source requires steady fuel. Such, like coal, gas or oil has to be purchased. Hydropower potential means: an amount of water (flow) which flows down a certain height. To utilise such, the produced electricity is to be transportet by powerline to potential users. Hydropower offers a significant potential of renewable energy production. In 2009 electricity production from hydropower was about 16% of the global electricity production. The undeveloped capacity ranges from 30% in Europe up to 88% in Africa. Small hydropower potential is given in hilly or mountainous regions, where rivers do not fall dry during the year. Where gravity fed irrigation is practiced small and micro power plants find suiting conditions. Mountainous regions often have bad infrastructure and are least to be connected to a electric grid. If there is water available it may be a suitable source for decentralised hydro power electrification. Such setups may even get support from governmental or major electricity supplier. The costs to connect remote areas are high, whereby the revenue, due to little amount of electricity utilised, is low. Hydropower usually operates 24 h / day. Most mhp's are connected by a grid to their consumers. If a connection towards the national or main grid is available, electricity can be fed in there. 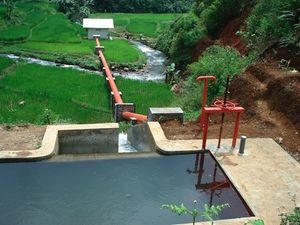 Often micro or pico hydropower units are installed in remote areas. There they feed an isolated grid. In such grid the MHP is usually the only power source. The power produced has to be leveled equal with the power consumed (see controller). Battery storage is no must like at solar or wind power projects. This is a big advantage as it reduces costs and maintenance significantly. Charging stations can nevertheless extend a mhp's effectiveness by utilising power in times of low demand (late night). Like this, even consumers which are too far from the station to be connected by transmission cable can be served via rechargeable batteries. divertion constructions in the river, Guiding water per canal and pipe, the electrical-mechanical equipment to turn water power into electricity plus transmission lines and house connections. Nevertheless if it is community based, main challenge will be the social setup. The people of the community who will build / use the MHP have to be introduced, trained, learned and encouraged to organise, operate and manage their power station. A sustainable working mhp scheme requires users who are enabled to understand "their" system. Again, "head and flow" matter. The best geographical areas for exploiting small-scale hydro power are those where there are steep rivers flowing all year round. The Andes, the Himalayas, islands with moist marine climates, such as the Caribbean Islands, the Philippines and Indonesia are widely suitable. Laos, Vietnam and wide parts of China use Micro Hydro Power in large numbers. Minimal Flow may be 20 l/s. Power is according to head output (see power estimation). Mini Hydropower operates constantly and requires little maintenance. It is ideal for powering remote regions. Although grid connection is very feasible due to its very low operational costs. Flow data should be gathered over a period of at least one year where possible, so as to ascertain the fluctuation in river flow over the various seasons. At least measures must be taken during dry season to assure that there is always enough water to power the turbine. Too little water results in power cut. If such is not clear to consumers from begin with it can seriously endanger the projects success. The major cost of a MHP scheme is for its site preparation and equipment. It's nearly 100 % upfront investment and very low running cost (operation and maintenance). Cash usually is a scarce resource in rural areas of development countries. Part of a feasibility study has to be: how high tariffs have to be set to cover the costs. Its a must to, at least, break even operation & maintenance expenses. This money has to come from the users for electricity or el. services. A mhp can operate many decades if tariffs cover repair costs. In the long run a mhp's management is the crucial factor for its success. Tariff setting is a crucial element. In case the mhp management is community based, tariffs have to be set in acceptance with the community. Ensure sufficient high tariffs! Community discussion may be lengthy, be patient. 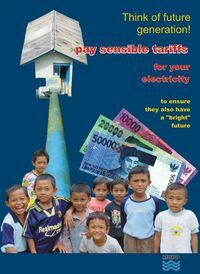 Never leave the impression that mhp-electricity may be "for free". Examples: Compare the cost for oil wig lighting with a single bulb. Compare "luxury" expenses with the comfort of el. lighting (cigarettes, drinking, ...). Explain the management function like how to run a business. Minimally the revenue has to cover the expenses. Check download section for an excel-tool which shows cost coverage. Availability of cash gives also other possibilities to gain additional revenues. E.g. to build storage capacities which can house a communities harvest; by gross deals during off season prices are high. Main non financial efforts at microhydro installations are: the right choice of sites, their specific planning and supervision of quality standards; all this is esp. 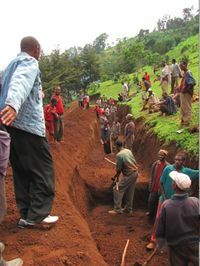 laborious in remote areas. If a scheme is community based, such plays a key role. use existing infrastructure, e.g. irrigation canals, mills, old mhp-sites (rehabilitation). electronic load controller - ensure stable voltage and frequency which does no harm to appliances. It allows additional automatized features like battery charging or freezing. As more sophisticated the appliances become as more required a load controller will be. a mhp plant close to village avoids expensive distribution lines or even transformers. For more links on MHP, click here. ↑ IPCC Special Report on Renewable Energy Sources and Climate Change Mitigation, Chapter 5 Hydropower (2011). Prepared by Working Group III of the Intergovernmental Panel on Climate Change [O. Edenhofer, R. Pichs-Madruga, Y. Sokona, K. Seyboth, P. Matschoss, S. Kadner, T. Zwickel, P. Eickemeier, G. Hansen, S. Schlömer, C. von Stechow (eds)]. Cambridge University Press, Cambridge, United Kingdom and New York, NY, USA, 1075 pp. ↑ 3.0 3.1 3.2 3.3 3.4 3.5 http://srren.ipcc-wg3.de/report - Prepared by Working Group III of the Intergovernmental Panel on Climate Change [O. Edenhofer, R. Pichs-Madruga, Y. Sokona, K. Seyboth, P. Matschoss, S. Kadner, T. Zwickel, P. Eickemeier, G. Hansen, S. Schlömer, C. von Stechow (eds)]. Cambridge University Press, Cambridge, United Kingdom and New York, NY, USA, 1075 pp. This page was last modified on 21 September 2018, at 14:13. This page has been accessed 107,822 times.